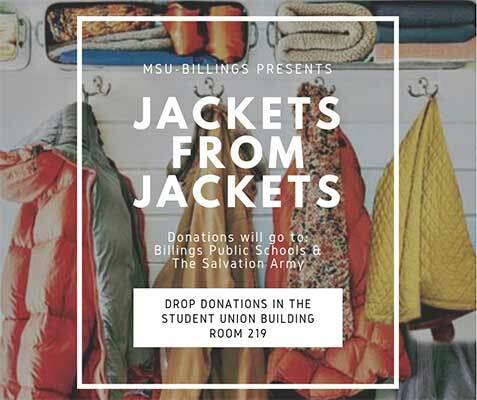 MSU BILLINGS NEWS— The MSU Billings Center for Engagement, Student Activities Board (SAB), and Associated Students of MSUB (ASMSUB) recently launched Jackets from ‘Jackets, a community engagement project to address winter clothing insecurity. Jackets from ‘Jackets donations will benefit homeless youth and help fill unmet needs of Billings Public Schools and the Salvation Army, casting a larger net into the community by reaching children, adults, and families. Student leaders from SAB and ASMSUB visited with the Center for Engagement about opportunities to impact the Billings community and give back, with the goal of reaching Billings high schools. The idea of doing a coat drive arose as SAB was searching for a passive program for MSUB students to get involved with as individuals and participate as they choose. This project invites MSUB students, faculty, and staff to donate coats, jackets, and snow pants to those in need through donation bins located in the Student Union Building Atrium, Liberal Arts building, and City College Commons. All sizes of warm outerwear will be accepted, although adult sizes are preferred. Items should be new or gently used. Donations will be accepted from Nov. 19, 2018 through Feb. 1, 2019 and will be included in Power of One Week, which is Jan. 21 through 25. “MSUB students love passive events where they can drop in and quietly participate on their own terms,” shared Emily Willoughby, SAB chair. “This is an opportunity for students to be involved in the community of Billings without leaving campus. For more information, contact the Center for Engagement at 657-2387 or engagement@msubillings.edu.